← More cake… Om Nom Nom! I vividly remember learning of Jim Henson’s death. I was listening to the radio as I drove to attend a coaching clinic. I pulled into the parking lot of the athletic centre and burst into tears. I was a week away from turning seventeen. I didn’t know Jim Henson… I knew Kermit, Ernie, Sam the Eagle, the Swedish Chef, Dr.Teeth, Rowlf, Waldorf, Guy Smiley and Cantus Fraggle. This week I’m grieving for Mork, Popeye, Adrian Cronauer, John Keating, Peter Pan, Mrs. Doubtfire, Genie, Alan Parrish, Armand Goldman, Sean Maguire and Teddy Roosevelt. But something has been bothering me since I learned of this death. I just wasn’t able to put my finger on it until now. 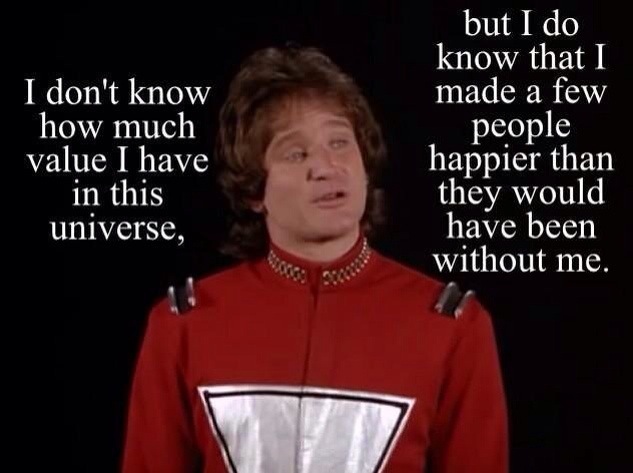 Yes, I’m sad about Robin Williams because, like everyone else, I loved his work. However, unlike Jim Henson’s death, the news didn’t shock me. He was sick and suffering from a disease. This disease killed him. As PopChassid wrote, Robin Williams didn’t kill himself. It is time we acknowledged that a disease in the brain is just as physical as a disease in the heart, lungs, or liver. The fact that it is more complicated, less understood, and only beginning to be studied, does not mean we can ignore this fact. In truth, it means the exact opposite: that mental health needs to be treated with urgency. That our society has to start treating its illnesses as every bit as deadly and malicious as other ailments… Until our society aggressively, strongly addresses mental illness, until we move it from a side issue to a real issue, until we give it the same priority as other illnesses… I will still shake my head at the death-by-disease that is called suicide. This entry was posted in General, Mental Health and tagged Jim Henson, Mental Health, Mork, Robin Williams, suicide. Bookmark the permalink. Thank you for this thoughtful piece. Heavy hearted. Thank you for this. I also felt a sense of “yup, exactly as per the script” when I heard the news. What is surprising is how much his death has affected me. I am still close to tears almost a week later. There’s more going on here than the loss of a talent, a comic, a kind, gentle, generous man. A life-giving spark has been snuffed. Such a huge loss! Thanks for taking the time to comment, Maggie. I love the image of Mork and the quote on it. It’s a valuable lesson he left for us. It’s a legacy and he made in impact on the stigma on suicide. Just equally good to read from Pop and I kept on repeating it to anyone who would listen that this is a disease of a brain. I was surprised when I first heard the news, but I wasn’t shocked. That’s significant, I think. Very significant. It was like when Chris Farley died… did that surprise anyone? Thanks Eric! I hope to be back into full swing soon.